Use the form below to register your equipment for full factory warranty. 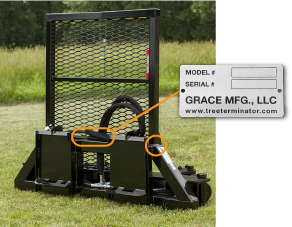 All Tree Terminator products must be registered within three months of original sale for full factory warranty. Tree Terminator, hereinafter referred to as Manufacturer, warrants each new implement to be free from defects in material and workmanship under normal use and service for a period of two (2) years on all welded components and one (1) year on the cylinder, motor, and gearbox hydraulic components from the date of original sale. Hydraulic hoses are not covered by warranty. This warranty is expressly in lieu of all other warranties and representations, expressed or implied, and all other obligations or liabilities on the part of the Manufacturer. Manufacturer’s liability and obligation is limited to repair and replacement of the product or a refund of the purchase price, at Manufacturer’s option, provided the purchaser returns the claimed defective product to the Manufacturer or authorized distributor, with transportation charges prepaid, and an examination by Manufacturer discloses the product to be defective. This warranty does not cover said product that has been repaired or altered outside of the factory of Manufacturer in any way as to, in the judgement of the Manufacturer, affect the stability, reliability, or performance of the product. This warranty does not cover damage or product failure caused by accident, misuse, negligence, tampering, improper attachment, or improper maintenance. This warranty excludes all liabilities for consequential or incidental damages. This warranty gives you specific legal rights providing said product is put to its proper designed use. Register your product for warranty and owner’s manual to be emailed to you at the address you provide.